One of the leading halakic amoraim in Palestine during the latter part of the third and in the beginning of the fourth century. In his youth he studied under R. Eleazar II. (Tos. to Ḥul. 34a, s.v. "Man Ḥabraya"); and he transmitted nine of his teacher's halakic sayings, seven of which are contained in B. Ḳ. 11, end, one in 'Er. 21b, and one in Ket. 74a. He was greatly respected for his learning; and during his visits to Babylonia he seems to have been invited frequently by the "resh galuta" to deliver halakic lectures (Ket. 65b; Ḳid. 31a; Shab. 157b). He traveled repeatedly to Babylonia; and on one of his journeys he was in danger of assassination by one of his companions, saving his life only by condoning the murder of another (Ned. 22a). Ulla rendered important decisions regarding the benedictions and the calculation of the new moon, and was accustomed to promulgate his rulings in Babylonia when he went thither (Ber. 38b; R. H. 22b; Pes. 53b, 104b). He was very strict in his interpretation of religious laws (Shab. 147a, 157b); and on one occasion, when he heard R. Huna use an expression which he did not approve, he retorted, "As vinegar to the teeth, and as smoke to the eyes, so are the words of R. Huna," applying to him the first half of Prov. x. 26 (Ḳid. 45b). Only in the presence of R. Naḥman did Ulla hesitate to pronounce his opinions, generally waiting until the former had departed (Giṭ. 11b, 12a); although he frequently sought Naḥman's company (Ket. 53a). Of his contemporaries with whom he engaged in controversies may be mentioned, besides R. Naḥman, R. Abba (B. M. 11a), Abimi bar Papa, Ḥiyya bar Ammi (Ket. 53a), and R. Judah (Ḥul. 68b, 70a); but his personal friend, with whom he associated most frequently, was Rabbah bar bar Ḥana (Tosef., Ḥul. xxxiv. 1). In addition to the sayings of his teacher Eleazar, Ulla transmitted those of R. Hoshaiah (Ḥul. 76a), Joshua ben Levi (ib. 122a), R. Johanan ('Er. 67b), Rab (Shab. 143b), and Simeon ben Laḳish (Ḥag. 8b), while his own sayings were transmitted by R. Aḥa bar Adda (B. M. 117b), Hamnuna (Shab. 10b), Ḥiyya bar Abba (Ḥag. 25b), Ḥiyya bar Ami (Ber. 8a), Raba bar Ḥinena (Men. 30b), R. Ḥisda (Ber. 38b), Judah bar Ammi (M. Ḳ. 5b), and Joshua bar Abba (ib. 5b). Raba appears to have been his only son (Shab. 83b). 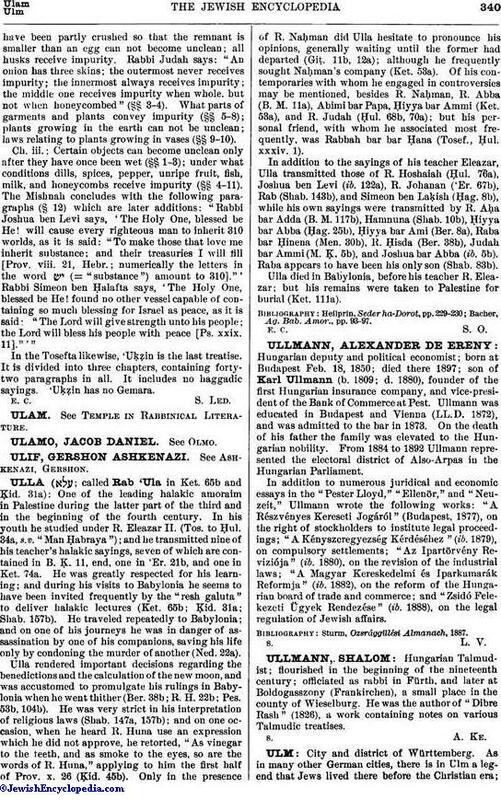 Ulla died in Babylonia, before his teacher R. Eleazar; but his remains were taken to Palestine for burial (Ket. 111a). Bacher, Ag. Bab. Amor., pp. 93-97.